← Wednesday’s Word: How Long, O Lord? 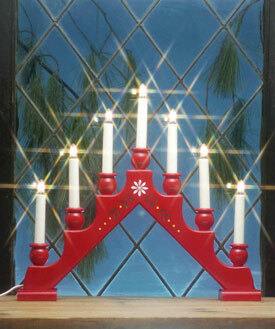 Several Swedish candelabras light up my big, Pacific NW-style windows over the Christmas season. Their bright, red color and white lights give my over-sized windows a feeling of coziness that’s missing the rest off the year. This past weekend, I reluctantly took them down and put them away with the rest of the Christmas decorations. My youngest daughter commiserated with me. “The house seems so sad without them!” she moaned. A friend, who had walked past my house during the holidays, told me that her son was asking her if my candelabras “meant anything.” It’s a great question, and it got me thinking. How much do we all know about the various candelabras that are used during the winter season? Test your knowledge with this small quiz! Answers, and more details will follow next Sunday. Think how smart you’ll be next year when the holidays roll around again! 1. How many candles are in a Swedish candelabra? 2. How many candles are in a hanukkiya (Hanukkah candelabra)? 3. How many candles are in a kinara (Kwanzaa candelabra)? 4. Which candelabra’s candles symbolize a miracle that took place in 165 BC? 5. Which candelabra is NOT used to help celebrate a religious holiday? None of the above: all of the holidays celebrated are religious in nature. 6. Which candelabra includes a candle that is used only to light the other candles? 7. Which candelabra is the only one to be lit all at once? None of the above: all of them are lit one day at a time. 8. Which candelabra’s candles are red, black, and green? 9. Which candelabra’s candles have symbolic meaning based on their color? 10. What game is often played while Hanukkah candles are burning? Thanks for playing! How do you think you did? See you next Sunday with the answers and a little more explanation of the different celebrations! This entry was posted in Being a Good Neighbor, Diversity, Holidays and tagged Christmas, Hanukkah, holiday candelabras, Kwanzaa, Quiz. Bookmark the permalink. 2 Responses to Winter Candelabras: Quiz Time! Don’t feel bad, Cinda! To tell you the truth, one of the reasons why I put the quiz out there was because I didn’t know any of the answers either, except for the one about how many candles were in the Hanukkah candelabra. When my friend asked me about my Swedish one, I realized that I didn’t really know much about any of the holiday candelabras, but I wanted to find out!